Pete Venters’ art is not everyone’s personal cup of tea, but I’ve always liked a lot of his pieces, and especially this one. It has a poignancy that you don’t always get with images of fire and explosions and colors that match the color of mana the card is. In gameplay, I’m not sure it’s poignant so much as ruthless. 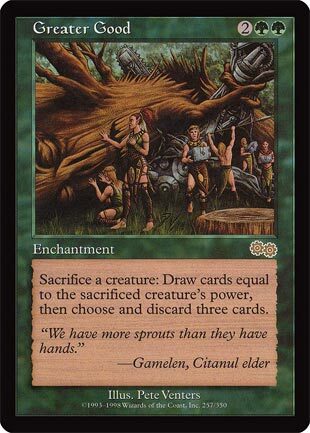 At the time of its release, it seemed natural to try and combine it with creatures that have at least three power themselves; despite not really being able to get card advantage out of it until you get to the really high-end creatures, picking up the extra cards can pay off. As things have progressed, though, there’s no shortage of either creatures that want to go to the graveyard for some reason, or cards that don’t care if they’re discarded for some reason (the first flashback cards appeared just three years after Greater Good). The compulsory discard fortunately puts a brake on endless sacrifice shenanigans, as many decks won’t want to lose so many so consistently without some kind of plan involving flashback, reanimation, or the like. Greater Good came back in Battlebond, and it’s a very “green” card at its core. Sacrifice a creature, draw cards…at the cost of having to discard down afterwards. Green being the color of powerful creatures in general makes this a better sell, and a zero-mana sacrifice outlet is always powerful. It’s not quite there in Constructed; Evolutionary Leap is a slightly better sacrifice outlet in Modern, and Birthing Pod is repeatable advantage, and both are more reliable about getting you what you might need to win the game. But if you’re not picky, Greater Good can get you there, and the synergies it offers in Golgari- or Sultai-colored shells is well worth it. It plays strongest when it’s not playing “fair”, which always is the case.